a : overall quality or character as seen or judged by people in general. Uncovering that special business who excels with a reputation of excellence, knowledge about product and exceeding all expectations can be a very daunting task. 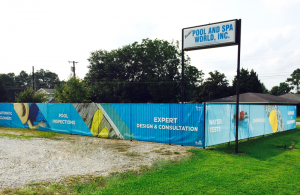 This is not the case with Cricket’s Pool & Spa World located at 1200 Rue Du Belier in Lafayette. You experience a relaxing and inviting atmosphere immediately upon walking into Crickets and are greeted by staff with friendly smiles eager to serve. Dependable, high quality pool service and excellent supplies are the norm. A proven track record and a full line of extensively tested products is what separates Cricket’s Pool & Spa World from the rest, placing a great big consumer stamp of approval for quality and dependability on them. At your Backyard Place, Cricket’s Pool & Spa World stands behind their great selection of products and supplies, and will help you take care of your pool all season long. They’re fully stocked with reliable brands for your convenience, and their knowledgeable staff can help answer all your pool questions. First impressions are lasting ones, especially when you’re the best at what you do. Pixus agrees with this mantra and believes the look of your business is essential to the success of your business. For over 20 years Pixus Digital Printing has been helping businesses reach their full potential with vehicle wraps, signs, banners, window graphics, mesh fence banners and more to grab the attention of potential customers. 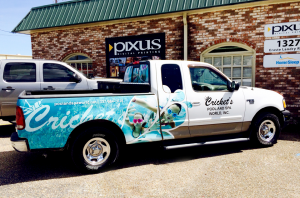 Pixus is extremely proud to have been given the assignment of transforming Cricket’s storefront by creating mesh fence screens and perforated window graphics, as well as adhesive vinyl wrapping of the company vehicles of Cricket’s Pools & Spa World. The results have been breathtaking. Cricket’s Spa & Pool look forward to continuing to serve you with high quality pool supplies and service.